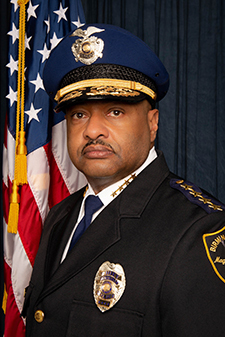 PATRICK D. SMITH is the 34th Chief of Police for the Birmingham Police Department. Chief Smith has 28 years of law enforcement experience with Los Angeles Police Department (LAPD). Chief Smith’s last assignment with the LAPD was Police Commander, Assistant Commanding Officer of the Police Science and Training Bureau, where he oversaw all aspects of law enforcement training, Use of Force Review and development of Tactical Directives. Chief Smith previously served as the Commanding Officer of the LAPD Metropolitan Division, which includes SWAT, K-9, Mounted Enforcement Platoon, Underwater Dive Team, Dignitary Protection, and Crime Suppression Platoons. Chief has directed large-scale significant tactical events, specialized crime reduction strategies and patrol operations. Chief Smith worked his way up through the ranks in LAPD as a patrol officer, police field training officer, and instructor, sergeant, lieutenant, captain, and police commander. Chief Smith has focused his career on crime reduction strategies and building public trust, including police training, reviewing critical use of force incidents, and developing policy for best practices in policing. Chief Smith has a Bachelor of Science Degree in Business Management and a Master of Arts Degree in Organizational Management. He is a native of Tuscaloosa, Alabama, and a proud veteran of the United States Marine Corps.